The Outdoor Scene considers quality of products as our biggest responsibility to customers. For that reason, we offer you the most trusted manufactured metal sheds from Biohort, with a 20 year no-rust warranty. Say goodbye to your shed painting days and invest in one of our steel sheds that are guaranteed to be an economical garden furniture investment. 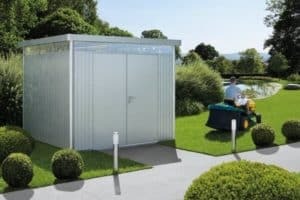 The Austrian company, Biohort, is one of our most trusted brands for steel sheds and exterior storage solutions in Ireland. Biohort's ideal design and superior quality products are guaranteed to impress you and help you to refurnish and reorganise your garden easily and fuss free. The Outdoor Scene is happy to present the compact and stylish outdoor plastic boxes. While some have a wooden design and colour and would integrate well with the vegetation of your garden, others boast bolder colours that will add vitality and versatility to your outdoor garden furniture area. Our staff will assist you in choosing the perfect storage box that suits your backyard, your personal requirements and your preferences. Don't forget to take garden measurements to ensure that your plastic storage box purchase fits your ideal location. Our expert staff will advise you on the best ways to maintain and care for your new purchase. Do you have many children and need to store their bikes and playing equipment neatly? Or perhaps you need a place to store fire logs for the winter? Or maybe you have a pool or a garden patio that has many leisure equipment lying about? All your valuable garden apparatus and accessories deserve a safe, secure and convenient storage space. From cushions, toys, utensils, tools, outdoor dining sets, bins, rugs, lawnmowers, pots and plants, or disused furniture, there are so many things that need putting away and safekeeping. Our steel sheds for outdoor gardens come in so many shapes and sizes so that when you decide to organise and safeguard your properties, Biofort sheds are an indispensable outdoor storage essential. Call our store, or purchase online with the exact size and purpose requirements for your ideal shed and our expert staff will help you every step of the way. Do you fear assembling your shed together? Our professional and experienced assembly staff offers to attentively and carefully build and set up your storage option in any outdoor location. What if you already have a shed or a storage box, but need to enhance its purpose with elemental accessories? Those badmintons or ping pong games need a storage net, those garden spades, tools and pots need shelves and hooks, bikes would fit better with bike holders. Maybe your shed is in need of a floor panel or rainwater pipe? Check out all our fundamental accessories to help organise you to perfection and store all your items in the most accessible and neat fashion. Friendly, professional and experts in garden furniture retailing, our staff are will be at your service. 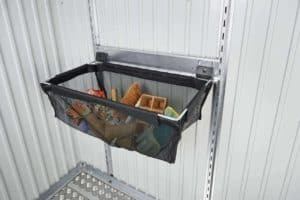 We will offer our advice on maintaining and caring for any storage purchase you make, as well as suggest the perfect accessories to complete your purchases. No questions or queries will be left unanswered and we strive to deliver quality products as well as excellent customer care. Don't forget that the Outdoor Scene's assembly services for local Dublin area customers are available to ease your product installation. FREE delivery on all garden furniture means you get value for the investment you make with Outdoor Scene. For other category products, browse the catalogue online.